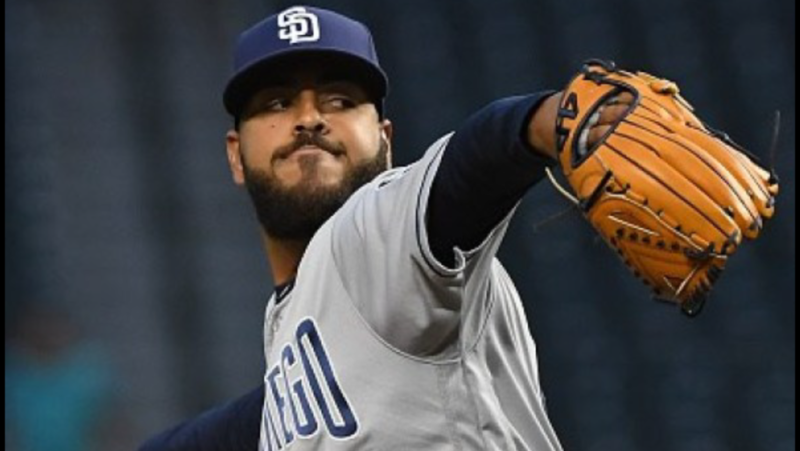 Pedro Avila made his debut for the Padres, and after a rough first inning, he settled down and pitched well the rest of his outing. 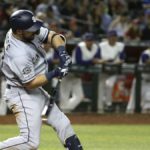 After getting ahead 6-1, the Padres allowed the Diamondbacks to claw back into the game before a Manuel Margot home run gave the Padres a 7-6 victory. The Padres went down quietly in the top of the first inning, and Avila took the mound for his major league debut. Avila utilizes a four-pitch mix but did not have much command of any of his pitches during the first inning. He consistently left pitches up in the zone, allowing the Diamondbacks to crush the ball to all parts of the field in the first inning. He allowed three hits and a run but was able to get two big strikeouts to help limit the damage, only allowing one run in the inning. After the first inning, Avila settled down and pitched to his strengths. He looked especially sharp in the bottom of the third where he only needed nine pitches to send the Diamondbacks down 1-2-3. What was impressive about Avila was his ability to mix up his pitches, as displayed in the picture. He used his slider primarily during the third, adjusting from when he primarily used his fastball in the first two innings. In took the Padres until the top of the fourth inning to put any runs on the board. Franmil Reyes, whose average before the game sat at .143 might make it look like he is struggling, has on the contrary been hitting the ball harder than anyone on the team. He sent a solo shot off his bat at 109.3 mph to deep right-center field for a 412 foot home run. The comeback kids were at it again in the sixth inning. Myers led things off with a walk, followed by a Hosmer single which allowed Myers to head over to third. Manny Machado then strode to the plate and plated Myers on a single, to give the Padres a 2-1 lead. Hosmer advanced to third on the play, giving Hunter Renfroe a first and second situation. Renfroe made it on base safely via an infield single, loading the bases with no one out for Reyes. Reyes struck out, giving the Diamondbacks their first out of the inning. Fernando Tatis Jr. inherited the bases loaded situation, and hit a sacrifice fly to deep right field scoring Hosmer and the Padres lead 3-1. 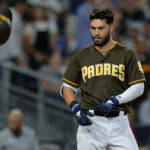 Austin Hedges then came to the plate and demolished a 1-0 pitch to left field for a monster 449 foot three-run home run, and gifting the Padres a 6-1 lead. Avila strode back onto the mound with renewed confidence in the sixth. However, after getting the first out of the sixth, Avila struggled with his command and walked the next two batters before he was relieved by Robert Stock. 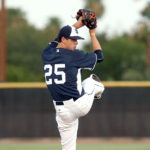 His final line in his first big league game was five and a third innings, with five strikeouts, four hits, and one earned run. Stock then coolly defused the Diamondbacks attempt at a rally, getting out of the sixth unscathed. 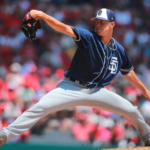 Unfortunately for the Padres, the bullpen imploded in the seventh, Robert Stock and Brad Wieck allowed five runs, including a three-run blast by Eduardo Escobar which would tie the game at 6-6. 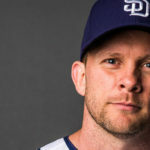 One could argue that the bullpen has been overused and overworked with all of the starters being taken out early in games, and it showed against Arizona. 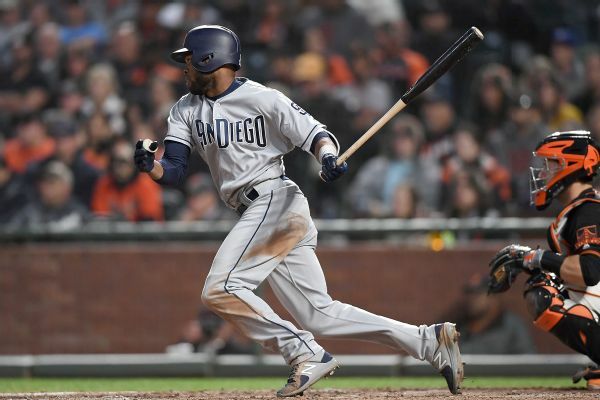 Manuel Margot, who had not started the game but came in as a defensive replacement, gave the Padres a much-needed answer to Arizona’s comeback. 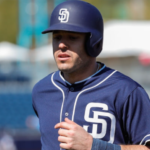 He killed a misplaced fastball that was left over the heart of the plate into the left-field bleachers, 407 feet away, giving the Padres the lead 7-6. After the Margot home run, Adam Warren sent the Diamondbacks down in order in the eighth, and Trey Wingenter earned his first career save and slammed the door shut in the ninth, but it was not without fanfare. He first got David Peralta to groundout, but then walked Adam Jones, before striking out Escobar. 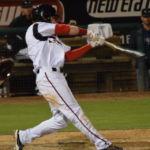 Then with two outs, he walked the pinch-hitter Christian Walker, before with two men on and two out Wingenter struck out Nick Ahmed to end the ballgame. The win and a Dodgers loss earlier today catapults the Padres into sole possession of first place in the N.L. West and the Padres are now 9-5 on the season.